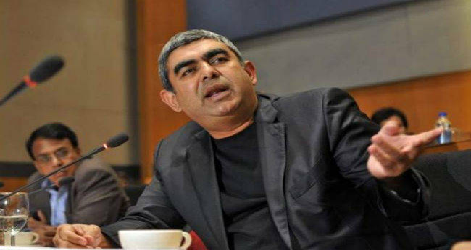 Infosys chief executive officer (CEO) Vishal Sikka's salary in 2016-17 dropped over 67 per cent on lower bonus payout, news agency Press Trust of India reported. The founder members of Infosys had earlier voiced concerns over the pay hike given to Mr Sikka. As per the annual report of Infosys, the cash component of Mr Sikka's salary was Rs. 16.01 crore, down from Rs. 48.73 crore in 2015-16. Also, his total compensation that includes bonus and grant of stocks fell by 7 per cent to Rs. 45.11 crore in 2016-17 from Rs. 48.41 crore in the previous fiscal year. However, chief operating officer UB Pravin Rao's total salary increased to Rs. 11.80 crore in FY17 from Rs. 8.14 crore in the previous year. Likewise, compensation of deputy chief operating officer, Ravi Kumar S, went up to Rs. 14.87 crore from Rs. 8.27 crore, the report added. Last month, Infosys founder NR Narayana Murthy had expressed anger over the steep hike in compensation to Mr Rao. The remuneration of Mr Sikka for last fiscal remains 283.07 times higher than the median remuneration of employees (MRE) of Infosys. The MRE of Infosys for financial year 2016-17 stood at Rs. 5,65,585. Also, presidents Mohit Joshi, Sandeep Dadlani and Rajesh Murthy received total compensation of over Rs. 14 crore each. Mr Joshi got Rs. 14.62 crore in 2016-17, up from Rs. 9.02 crore in the previous year, Mr Dadlani got Rs. 14.97 crore as against Rs. 8.4 crore in the previous year and Mr Murthy got Rs. 14.25 crore as compared to Rs. 8.55 crore. In the letter to shareholders, Mr Sikka said the best and most talented employees want to be measured on performance - not role maturity or tenure. So in fiscal year 2017, stock incentives plan for top performers was introduced. Non-executive chairman R Seshasayee got Rs. 1.95 crore in remuneration in 2016-17 as compared to Rs. 1.84 crore in the previous year. Other independent directors too got a remuneration of over Rs. 1 crore.